Christmas has a way of awakening our desires. What we often don’t understand, however, is that our deepest desires are mere echoes of the great Reality that awaits us on the other side of time. 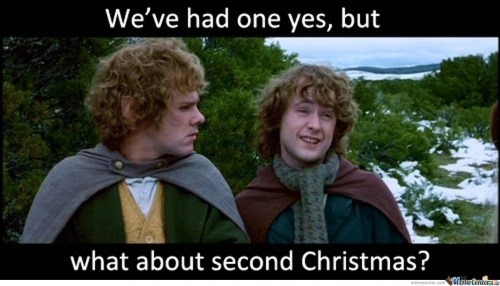 But at the same time, we have a certain amount of apprehension about second Christmas. What if, when it comes, we are disappointed? What if Jesus was just messing with us when he promised to take us to be with him (John 14:1-6)? I think our fears about his return fall into a few different categories. I fear that won’t enjoy the time leading up to it. The holidays between Thanksgiving and Christmas can get hectic and stressful. In the same way, the Bible indicates that the time before Jesus returns will be stressful. 1. Second Christmas (the return of Jesus) is going to come. Scoffers are mocking the promise of Jesus, saying he is never really going to come back. But Peter reminds us that God is not bound by the same rules of time that bind us. A thousand years might be like a day to the Lord, or vice versa. If that is the case, the church of Jesus Christ has only been waiting two days for him to return. It seems like forever – just like Christmas seemed forever away when you were a kid – but it is not forever. God doesn’t count time the same way we do, just like adults see time differently than kids. But he has not forgotten or changed his promise. He will come back. The time-delay is because of God’s mercy and grace (2 Peter 3:9 & 15). He doesn’t want anyone to miss out on a chance to receive the incredible gifts he is bringing. So he is giving the world a chance to repent of sins and self-centeredness, and receive him. We may be apprehensive, but we are dealing with a loving and gracious God. 3. This Gift has been promised to us, and we can rely on the promise. Peter says the earth and sky will be consumed in fire, but: “In keeping with his promise we are looking forward to a new heaven and a new earth, the home of righteousness. (2 Peter 3:13)” Again this is the same promise reiterated in Revelation 21, quoted above. It is unimaginably good; better than we could ask or conceive of. 4. The expectation of second Christmas should affect how we live today (2 Peter 3:14). Good Word! Thanks, Pastor Tom. “The time-delay is because of God’s mercy and grace (2 Peter 3:9 & 15). He doesn’t want anyone to miss out on a chance to receive the incredible gifts he is bringing. So he is giving the world a chance to repent of sins and self-centeredness, and receive him. We may be apprehensive, but we are dealing with a loving and gracious God.” Amen.